Not Just Movies: Made in U.S.A. Starting with a dedication to Nicholas Ray and Samuel Fuller worded as if they'd actually reared Jean-Luc Godard through childhood, Made in U.S.A. marks the final kiss-off from the genre pictures that Godard loved and loved to make. Its title works as both a sign of the fondness he still at least partly felt for the old films he championed so enthusiastically and the sarcasm with which he views the usage of the phrase as an advertising tool. The film is, in true Godard fashion, as much a satire of itself as it is a earnest attempt to make a political thriller. The mere sight of Anna Karina (in her final full-length collaboration with Godard) walking through "Atlantic City," which simply must be placed between quotation marks, in her garishly bright mod outfits immediately situations the film in opposition to the dreary trench coats and dull fedoras that made up the unofficial uniform of the private detective. Karina's Paula Nelson is indeed a detective, fashioned, save for the fashion, after Humphrey Bogart. Yet she wades through a world of such vibrant hues that even she compares her caper to wading through a Disney film. Paula heads to "Atlantic City" to meet with her former lover, Richard P...well, P-something, as a noise always drowns out his surname when someone speaks it -- I wonder if Tarantino based his equally arbitrary and cheeky decision to omit The Bride's name from the soundtrack of Kill Bill from this film. Upon arrival, however, she finds him dead, or at least officially so, with naught but a tape recording of his leftist rhetoric to give the character presence. Naturally, the disembodied voice belongs to Godard, who stands in for his own stand-in as the radical and the jilted lover. With its numerous, striking closeups of Anna Karina, whose faced was simply made for closeups, Made in U.S.A. is as much a kiss-off to Godard's ex-wife as it was the genre films that informed his early efforts. The plot quickly spirals out of control, the masking of Richard's surname indicative of Godard's wry overemphasis of political thriller tropes. Like The Big Sleep, every piece of acquired information only raises more questions, questions typically directed at the increasing jumble of half-baked ideas, cast-off lines and confusing characters. Rapidly, the importance of the narrative falls away, leaving behind fascinating aesthetic and thematic choices that far outweigh the interest of the entangled plot. As filled with pop culture references as it is aligned against the growing Americanization of French culture, Made in U.S.A. is the hippest film Godard made since Band of Outsiders. Aesthetically, it not only looks incredible -- more striking even than Contempt and Pierrot le fou -- but displays the director's constant wit in his arrangement of image and sound. Apart from the masking of Richard's name, Made also returns to the comic book imagery of Pierrot, cutting from a hand snaking out of a corner to yank in Paula to a graphic reading "Bing!" before returning to find our heroine stirring from unconsciousness. Jonathan Rosenbaum likened the film to "a Rauschenberg painting in motion," which may have been Godard's intent. Robert Rauschenberg was one of the artists who aided the transition from Abstract Expressionism into Pop Art, Pop Art of course being the grounding aesthetic of all of Godard's '60s features in color. A 2006 article in the Village Voice called him the American Picasso, and Godard references Picasso directly in the film. Certainly, Made in U.S.A. shares some of Rauschenberg's principles of collage and artistic appropriation and, more simply, they really do look similar, brightly colored puzzles that can be worked out, or not, and retain their charm. The imagery in Made in U.S.A. can be every bit as stupefying as its narrative, and it's important to note a character at one point saying "mise-en-scène" as the subtitles translate it to "mirage." 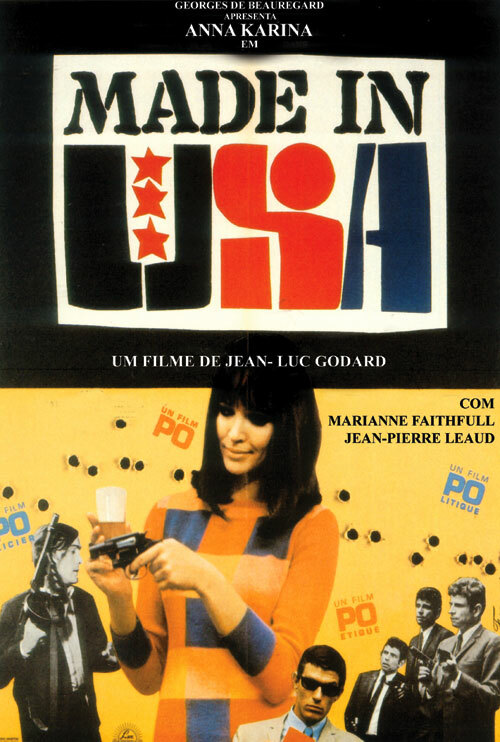 Made in U.S.A. also builds upon Godard's radicalism. His recorded diatribes harangue the Right, castigating their "sublime parry" which "gives the masses the facile emotion of courage without risk and pride without sacrifice." Yet Godard does not put forward merely a liberal rant. By setting the film a few years into the future, he can create a fake news bulletin that all politicians will received armed protection on election day. Even as he criticizes, through the visuals and the speech, the commercialization of French culture and the country's increasingly uncomfortable synergy with the American government, Godard does not ask for a break. In one of those tapes, he dismisses the idea that France can only retain its identity through a break from the U.S. Such a solution is reactionary and isolationist, and Godard wishes to keep it out of leftist rhetoric. The final few minutes of the film make for one of Godard's more memorable finales, as Paula discusses politics with Philippe Labro, a journalist playing himself. They get down to the obsolescence of the current political dialogue -- "right and left, it’s a completely outdated question. That’s not at all the way to pose the problem” -- but when the time comes to provide a new solution, the film ends, leaving that answer for another time. Make no mistake: Made in U.S.A. is far from a classic. Jean-Pierre Léaud looks downright bored working through his few lines, and at times the narrative sags so badly that it challenges the benefit of doubt one might afford to Godard given his penchant for telling the story between the narrative he sets up, as opposed to following through on it. Yet a key scene in the film, one that takes place in a diner, provides a perspective for the film. One of the patrons engages in a philosophical dialogue with the barkeep (and, eventually, Paula) which leads to him arguing the nature of a sentence and how it is defined. In response to the bartender and Paula's answers, he declares, "A sentence can't be meaningless and have a fuller meaning." Godard does not seem to know whether he can make both a flighty genre exercise and something relevant and innovative, and, for a time, I don't either. 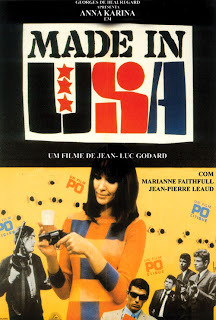 Made in U.S.A. is one of the few of Godard's films that did not wow me during this retrospective, yet it's also one of the most interesting and thought-provoking. Besides, its scattershot chic provides one half of a larger framework for the film's question of the dual nature of Godard's films when contrasted with his next film, shot simultaneously during the production of this film. But that's a matter for the next Godard article. great review. i still need to see this!